Total credit outstanding for corporations in Canada rose 2.6% to $834.1 billion during the second half of 2017, up $20.8 billion from the first half of the year. This marks a 7.7% increase for the year, with most of the growth occurring during the first half of 2017. There were two increases in the Bank of Canada's policy interest rate during the second half of 2017, pushing the key rate to an eight-year high of 1.0%. 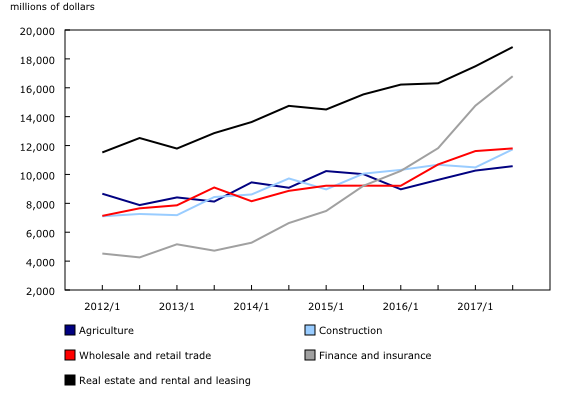 At the same time, the Bank of Canada's Senior Loan Officer Survey reported that lending conditions (price and non-price) eased owing to greater competition by suppliers of business financing. In terms of percentage change, total credit outstanding grew in all sectors in the second half of 2017 except for other primary industries (which includes mining, quarrying and oil and gas extraction) and the transportation and warehousing industry. The professional services industry registered the strongest growth, up 6.0% from the first half to $30.1 billion in the second half. In absolute terms, growth in credit outstanding was largest in the real estate, rental and leasing industry, up $4.4 billion to $167.5 billion. This industry holds 20% of total credit outstanding, more than any other single industry. This is consistent with data from the Quarterly Survey of Financial Statements, which show that firms in the real estate, rental and leasing industry generally operate with higher debt-to-equity ratios than firms in the economy as a whole—specifically, a ratio of 2.0 for real estate, rental and leasing compared with 0.92 for the economy overall in the second half of 2017. According to research by CBRE, a commercial real estate firm, investment in commercial real estate in Canada totalled $43.1 billion for 2017, 24% higher than the previous year. This record high was driven by growth in the Toronto and Vancouver markets. The real estate, rental and leasing industry relied slightly more on financing from insurance companies and portfolio managers, receiving 14.3% of their credit from this source. That compares with insurance companies and portfolio managers being the source of credit for 8.8% for industries in the economy as a whole. Total term credit outstanding, which includes term loans and mortgages, increased 3.1% to $512.6 billion in the second half of 2017. 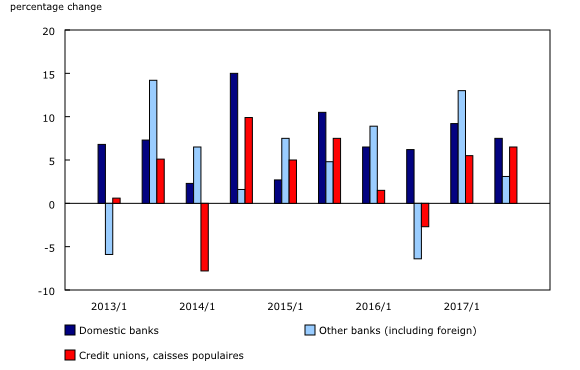 Major domestic banks led the growth in lending at 6.1% during the second half of 2017, while credit unions and caisses populaires increased their term lending by 4.8%. Other banks (including foreign) did not contribute to the growth in term loans, edging down 0.1%. Total disbursements for the second half of 2017 grew 6.5% to $120.7 billion, up $7.4 billion from the first half of the year. Lending to the finance and insurance industry contributed the most to this growth, up $2.0 billion or 13.8% during the second half of the year. The majority of lending was disbursed by major domestic banks, accounting for 53.8% or $64.9 billion in the second half of 2017. 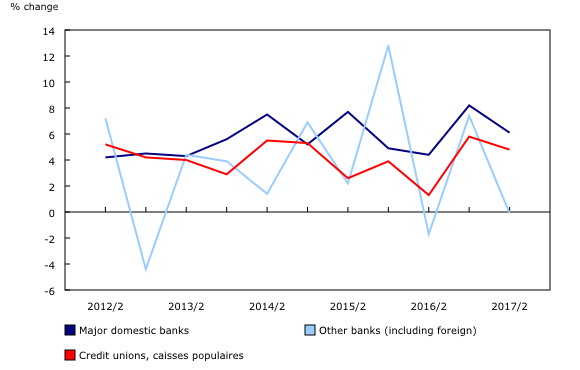 The growth rate in disbursements for major domestic banks was 7.5%, while credit unions and caisses populaires grew 6.5% and other banks grew 3.1%. Data from the Biannual Survey of Suppliers of Business Financing have been revised for the first half of 2017.